Bestselling author Dr. Munroe offers daily practical and biblical advice for women based on two of his most popular books, " Understanding the Purpose and Power of Women" and "Understanding the Purpose and Power of Men." 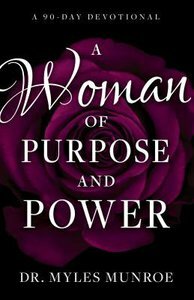 About "A Woman of Purpose and Power: A 90-Day Devotional"
Dr. Myles Munroe (1954-2014) was an ordained Pentecotal minister, the Founder, President, and Senior Pastor of Bahamas Faith Ministries International, an all-encompassing network of ministries headquartered in Nassau, Bahamas. He was a multi-gifted international motivational speaker, prolific best-selling author and sought-after business consultant. His books and presentations comprehensively address many aspects of human, social and spiritual development.